SpaceX Falcon 9 Rocket Breaks Up On Liftoff : The Two-Way The unmanned resupply mission had been intended to deliver much-needed supplies to the International Space Station. The SpaceX Falcon 9 rocket and Dragon spacecraft breaks apart shortly after liftoff Sunday at the Cape Canaveral Air Force Station in Florida. 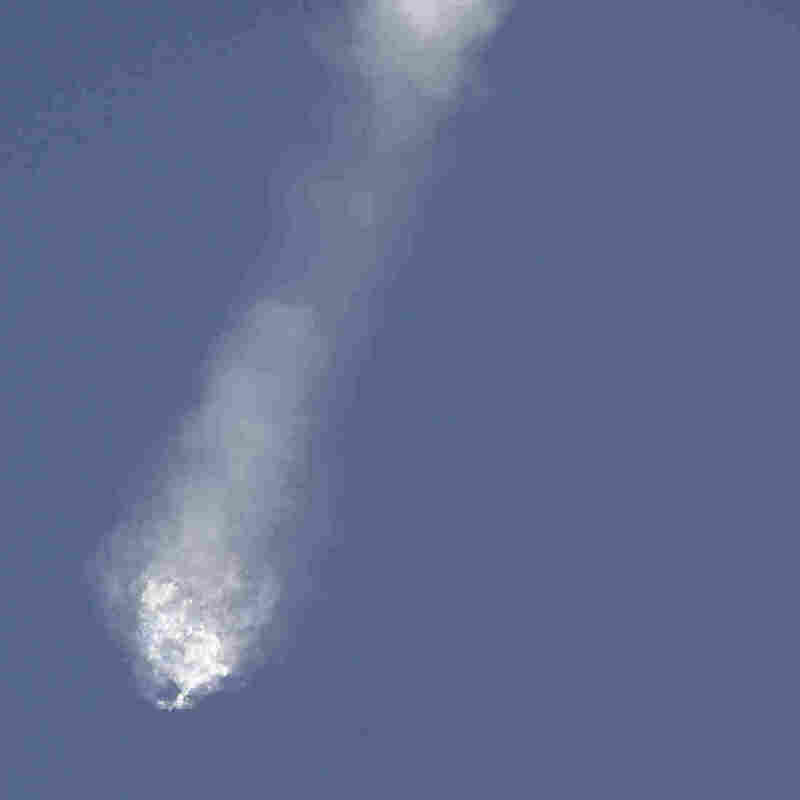 An unmanned SpaceX Falcon 9 rocket experienced what the private space launch company calls "some type of anomaly in first-stage flight" about two and a half minutes into its flight. NASA commentator George Diller confirmed that "the vehicle has broken up." Pieces could be seen raining down on the Atlantic Ocean over the rocket's intended trajectory. More than 5,200 pounds of cargo, including the first docking port designed for NASA's next-generation crew capsule, were aboard. The vehicle experienced an anomaly on ascent. Team is investigating. Updates to come. "We are working to identify the issue, to fix it and get back to flying," SpaceX President Gwynne Shotwell said at a NASA news conference. "We obviously are going to get back to flight," Shotwell said, adding that an accident investigation would take "a number of months." The failure deprives the International Space Station of a crucial resupply mission after a Russian cargo rocket also failed in April. Another resupply mission launched by private firm Orbital Sciences failed on liftoff in October. NPR's Geoff Brumfiel says that besides the docking ring "They had a brand new spacesuit in there and they had dozens of scientific experiments, both by professional scientists and students. They are all gone." "The three space station residents are in no immediate trouble because of the latest failed delivery. Late last week, NASA's space station program manager, Mike Suffredini, said the outpost had enough supplies on board to make it to October or so. "Russia expects to take another crack at launching supplies on Friday from Kazakhstan." However, as The Houston Chronicle notes: "This 1,000-pound adapter was due to be installed during a future spacewalk to allow SpaceX's Dragon and Boeing's CST-100 to begin docking as early as late 2016 or early 2017. So not only did one of NASA's commercial crew providers experience a serious problem today, the agency lost a critical piece of commercial crew hardware." The launch was to have been a third attempt for Elon Musk's SpaceX to try guiding the Falcon's spent first stage to a soft landing on a seaborne barge, known as a "droneship." Today's mission would have been the seventh Falcon 9 SpaceX launch to the ISS.